Pembroke Pines Commercial Movers. Office, Warehouse, Industrial. 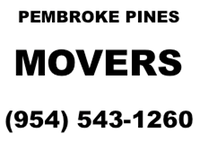 Pembroke Pines Commercial Movers is the premier commercial and industrial moving company in Fort Lauderdale, Florida. If you are in need of commercial, industrial, or corporate moving services then Pembroke Pines Movers is the best option out of all the competing companies who provide this service. This is because of our fully insured and qualified service, our dedication to our customer, and years of experience both with moving the Pembroke Pines Community, and the country on a national scale, and most importantly our dedication to providing this distinguished service to you, our customer, at the most reasonable price. Questions you should ask when moving your office or business is who will be responsible for my business equipment on my move? Are they accredited and qualified to handle the job? Are they efficient enough to move my business equipment and belongings to their new location on time and with courteous and professional service? Pembroke Pines Office Movers is a responsible, and fully accredited moving company who insures your belongings on every move. Our staff is the most professional and courteous staff in the business and knows that the customer is what ultimately brings them their employment. Our foremen and moving staff are here to provide you with proper and affordable service, and all with top of the line customer service.